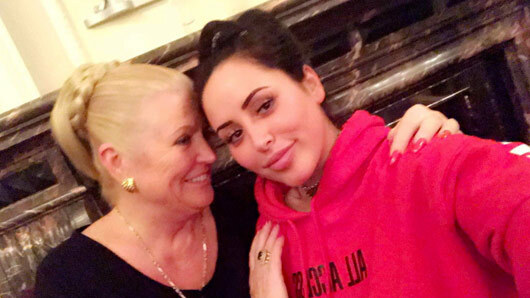 You might not have matched them as the most likely BFFs, but Geordie Shore‘s Marnie Simspon has found solace in a friendship with Kim Woodburn following her break-up with Lewis Bloor. The snap showed the two Celebrity Big Brother housemates cosying up during an evening catchup, with Kim giving Marnie a motherly cuddle. The How Clean Is Your House presenter paid Marnie a visit after hearing the shocking news regarding her split from TOWIE‘s Lewis. This week, it was confirmed that the Essex lad had cheated on her on Valentine’s Day. His unfaithful antics were first revealed on Snapchat, when Marnie confessed to seeing footage of him in bed with another girl. Later, Marnie took to Twitter to reveal that Lewis had also cheated whilst they were away on a romantic Valentine’s holiday together. Celebrity Big Brother will return for a summer series later this year on Channel 5.